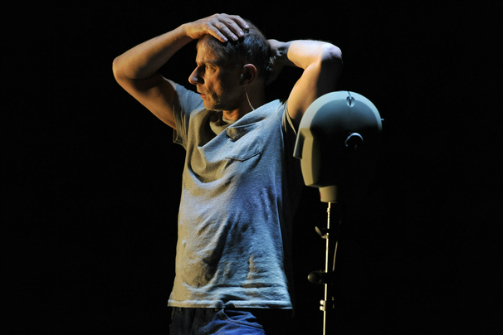 Simon McBurney in The Encounter. Photo by Robbie Jack. BOTTOM LINE: Simon McBurney of Complicite creates an auditory virtual reality where the audience has an intimate and immersive theatrical experience that defies the perception of time and space. Little Tuti danced the dance of rain. He recreated its rhythms sifting through the leaves, and its sound falling on the forest ground. The little Mayoruna boy captured the essence of nature by imitating three drops of rain, while the National Geographic photographer Loren McIntyre attempted to cram time into one single image. "A game and interpretation of reality"—that’s the phrase McIntyre uses to describe the dance. 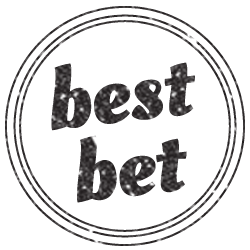 It’s also the very phrase to describe Simon McBurney’s theatrical phenomenon. The Encounter carries the audience along a hero’s quest that defies boundaries of time and space. The solo act follows McIntyre’s 1971 journey, when having finally discovered the source of the Amazon after years of searching, he makes personal contact with Mayoruna (Matsés) people, the indigenous inhabitants of the Peruvian and Brazilian jungles (more commonly known as the "cat people" for the whiskers they wear on their faces). McIntyre’s brief encounter with the Mayorunas, which initially was a stealth photo shoot opportunity at best, turns into a life-altering event as the photographer finds himself enraptured with the Mayorunas’ philosophy of life. He develops personal connections with the tribesmen, especially the headman, "Barnacle" (nicknamed after his warty skin), Barnacle’s son Tuti, and Cambio, who speaks Portuguese with McIntyre and finishes each sentence with "cambio" (meaning "over" in English), ergo the name. Cambio ultimately becomes Virgil to McIntyre's Dante, and guides the photographer through this unfamiliar realm. McBurney is able to recreate McIntyre’s narrative by isolating elements of sensory stimuli, painting a landscape with sound that transports the audience through time and space. One of the unique human experiences that distinguish us from other creatures is our ability to think in abstraction. Given the soundscape that includes rustling leaves, a roaring jaguar, and falling rain, each member of the audience is able to visualize a jungle that no set designer is capable of building on a mere stage. The set, in this case, is McBurney’s workstation before an entire wall of acoustic panels, and a binaural dummy head. During the performance, each spectator wears a headset that corresponds to the dummy’s "ears." Therefore, everyone can feel as if they are in the center of the action as McBurney moves about the stage. The distance between the stage and the audience diminishes, and it's as if the performer’s voice is in each audience’s head. Like the artist says, empathy is a product of proximity. Indeed the audience is able to have a more intimate relationship with the protagonist and become truly immersed in the world of the story, rather than observe from one fixed spot. "A voice in his head" is also what McIntyre experienced with the Mayoruna headman Barnacle. McIntyre claims to have received telepathic messages from Barnacle, an experience described as "hearing a voice in his head." The voice, according to McIntyre, is undoubtedly from Barnacle. Cambio the translator explains to the photographer later on that it is a wordless "old language." McBurney grasps fully the various philosophical ideas explored in McIntyre’s narrative and juxtaposes them with his own experimentations. One of the most important concepts, for instance, might be the perception of reality. From the very beginning, McBurney challenges the audience’s concept of reality and makes clear the fictional nature of his presentation. He isolates and introduces different technical elements used in the performance, like the digitally altered voice for the protagonist McIntyre, which is deeper and has an American accent (McBurney is British). McBurney shows the audience how he manipulates different recordings and sound effects in order to develop the story, establishing the artificial nature of a simulated reality. At one point McBurney carries out a conversation with himself using a recording from the past. At that moment, the past, the present, and the future are all in perspective and coexist on stage, which becomes a segue for McBurney to introduce the Mayorunas’ belief in the cyclical nature of time. Time is a tangible character in The Encounter, as well as in McIntyre’s narrative. The climax of McIntyre’s story is when the photographer joins the Mayorunas in a ceremonial dance as the tribe supposedly "returns in time," to escape the invasions of the "civilized" people, and to start their life journeys from the beginning. McIntyre relates that the Mayorunas burn their possessions, for those things "hold them still in time." In a way, the Mayorunas’ time travel has less to do with physical altercations of their surroundings, and more to do with a transformation of their perceptions of reality, through which they recreate the "beginning." Similarly, McBurney is able to achieve an immersive theatrical experience with this ambitious solo performance by having a deep understanding of the essence of human perceptions, and making full use of everything that’s readily available. McBurney, with the help of sound designers Gareth Fry and Pete Malkin, has turned the performance into a synesthesia-inducing, orgasmic auditory experience, and the rigidly structured Broadway theatre into an intimate, elastic organism that breathes through various dimensions. The Encounter is by Simon McBurney, based on Amazon Beaming by Petru Popescu. Co-directed by Kirsty Housley and McBurney. Associate Director is Jemima James. Produced by Judith Dimant. Set Design by Michael Levine. Sound Design by Gareth Fry and Pete Malkin. Lighting Design by Paul Anderson. Projection Design by Will Duke. Production Stage Manager is Adam John Hunter. The cast is Simon McBurney (Richard Katz at Wednesday matinees).